Fundraising for the 21st Century: Implementing a Recurring Gift Program. White Paper. What are Recurring Gifts? 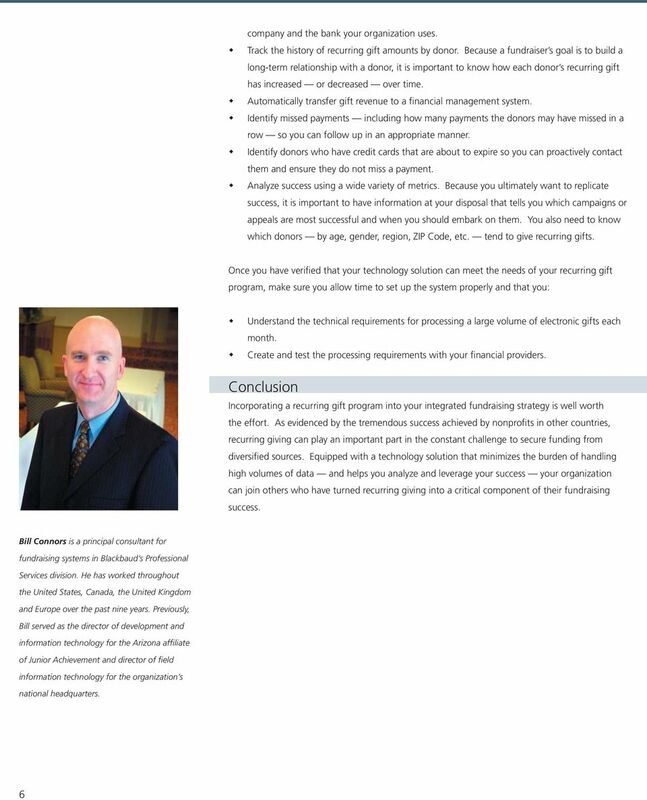 Download "Fundraising for the 21st Century: Implementing a Recurring Gift Program. White Paper. What are Recurring Gifts?" 2 Benefits Recurring giving has also been described as regular giving, as in those who give regularly. In the U.K., it is also sometimes called committed giving. An organization in Canada refers to recurring givers as sustaining donors. And others simply call it a monthly giving program. Regardless of what you call it, recurring giving is a powerful fundraising method for organizations of all sizes. 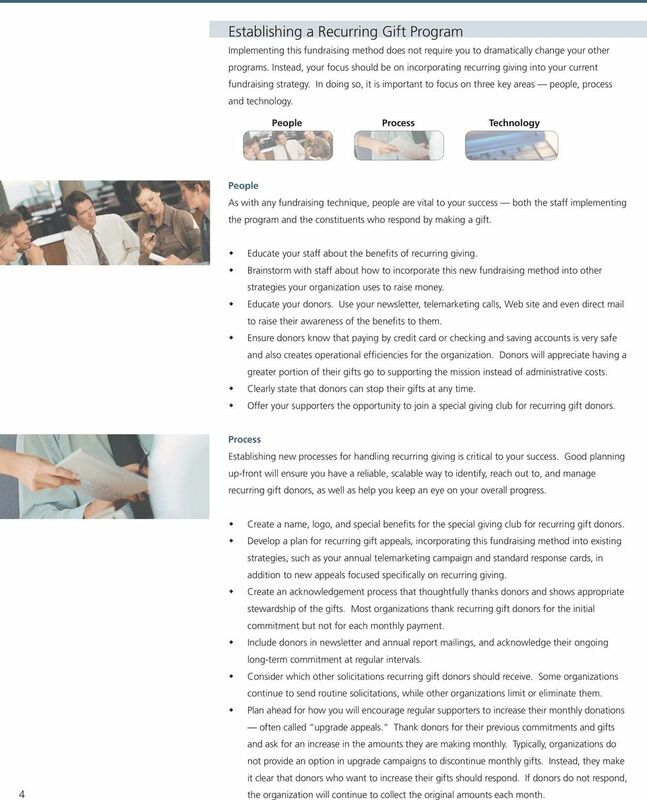 Recurring giving: Easily integrates with other fundraising methods being deployed at an organization. It is simple to add an option to your direct mail response cards and telemarketing scripts for donors to make recurring gifts. Because this method of giving relies on credit cards and checking and savings accounts for payment, it also makes sense to implement it as a part of your online fundraising initiatives. Is among the most cost-effective, long-term fundraising methods. The gift is only solicited once, and because it is handled electronically, processing costs are kept low. Additionally, donors must put forth effort to cancel their gifts, giving you the benefit of donor inertia (McKinnon, Hidden Gold). Provides a steady and reliable stream of income. Drop-out rates are low and predictable, so organizations can rely on future income more safely than upcoming direct mail or telemarketing efforts (McKinnon, Hidden Gold). Is convenient and easy. Once set up with an appropriate technology solution, thousands of gifts can be handled electronically, reducing the burden on staff. Recurring gifts appeal to prospects and donors for many of the same reasons: The cost-effective nature of recurring giving supports donors desire to know their money is going to programs instead of fundraising costs. Donors appreciate your need to have a reliable source of income that helps your organization make long-term commitments to projects, producing sustainable change over time. Recurring gifts are convenient and easy for donors. In addition to eliminating the need for checks and cutting down on direct mail and telemarketing calls a donor receives, recurring giving enables donors to give larger gifts over time than they might be able to make if asked to donate the same amount all at once. Finally, one very important benefit of a recurring gift program is that regular givers tend to be excellent major and planned gift prospects. Recurring gift donors have committed to giving your organization a gift every month, year after year. They clearly support the organization and believe in its cause. Challenges While recurring giving has great potential, it is not yet fundraising nirvana. Like all development methods, it has unique challenges that must be understood and addressed. 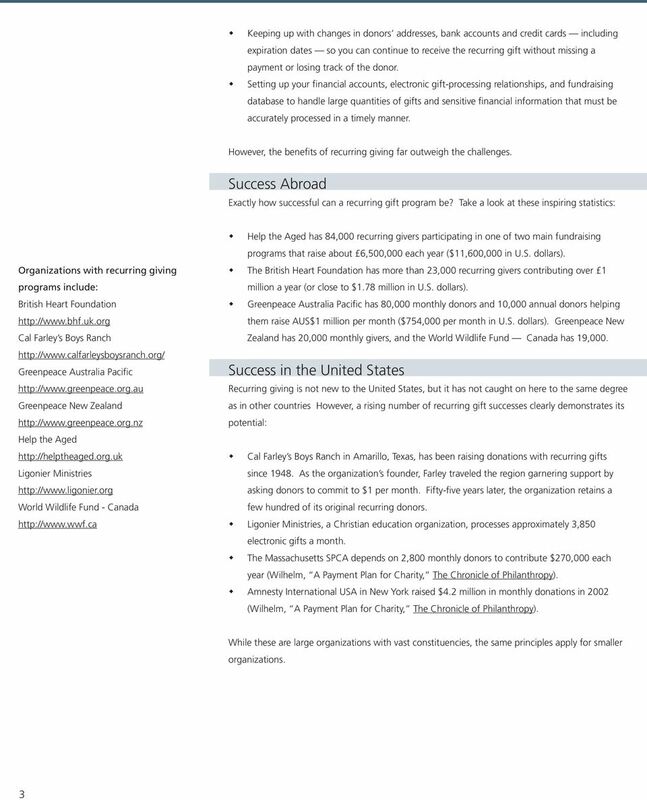 Some of the most common obstacles to implementing a successful recurring gift program include: 2 Educating prospects and donors about its safety and reliability. 4 Establishing a Recurring Gift Program Implementing this fundraising method does not require you to dramatically change your other programs. Instead, your focus should be on incorporating recurring giving into your current fundraising strategy. In doing so, it is important to focus on three key areas people, process and technology. People Process Technology People As with any fundraising technique, people are vital to your success both the staff implementing the program and the constituents who respond by making a gift. Educate your staff about the benefits of recurring giving. Brainstorm with staff about how to incorporate this new fundraising method into other strategies your organization uses to raise money. Educate your donors. Use your newsletter, telemarketing calls, Web site and even direct mail to raise their awareness of the benefits to them. Ensure donors know that paying by credit card or checking and saving accounts is very safe and also creates operational efficiencies for the organization. Donors will appreciate having a greater portion of their gifts go to supporting the mission instead of administrative costs. Clearly state that donors can stop their gifts at any time. Offer your supporters the opportunity to join a special giving club for recurring gift donors. 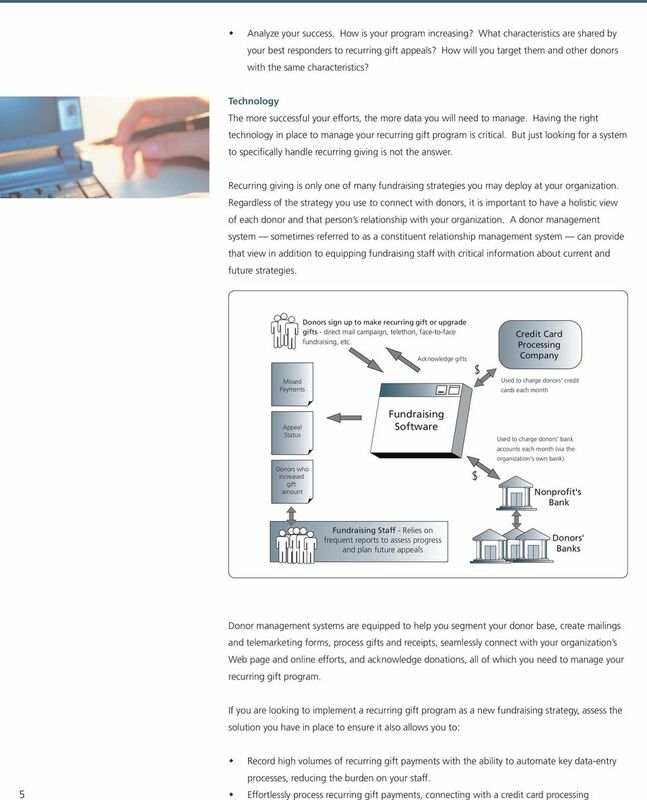 Process Establishing new processes for handling recurring giving is critical to your success. Good planning up-front will ensure you have a reliable, scalable way to identify, reach out to, and manage recurring gift donors, as well as help you keep an eye on your overall progress. 4 Create a name, logo, and special benefits for the special giving club for recurring gift donors. 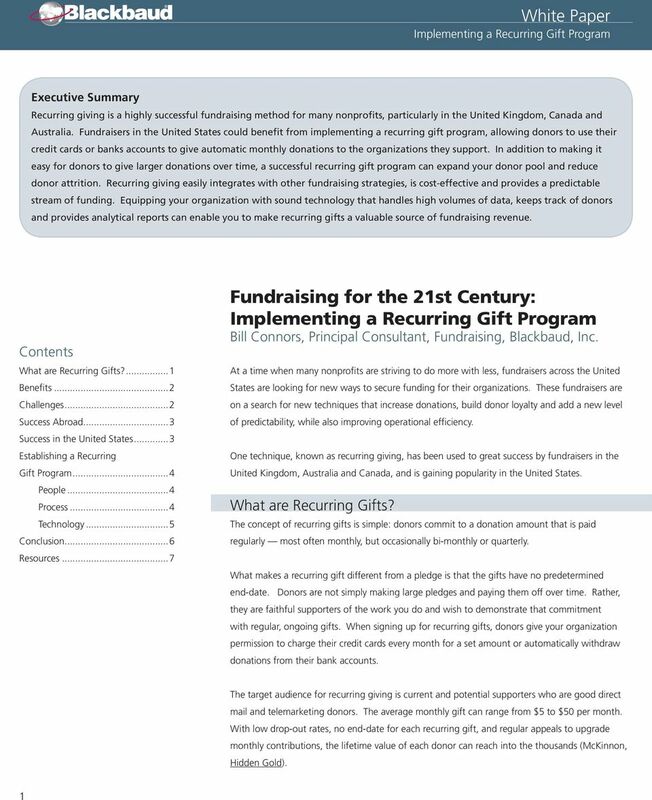 Develop a plan for recurring gift appeals, incorporating this fundraising method into existing strategies, such as your annual telemarketing campaign and standard response cards, in addition to new appeals focused specifically on recurring giving. Create an acknowledgement process that thoughtfully thanks donors and shows appropriate stewardship of the gifts. Most organizations thank recurring gift donors for the initial commitment but not for each monthly payment. Include donors in newsletter and annual report mailings, and acknowledge their ongoing long-term commitment at regular intervals. Consider which other solicitations recurring gift donors should receive. 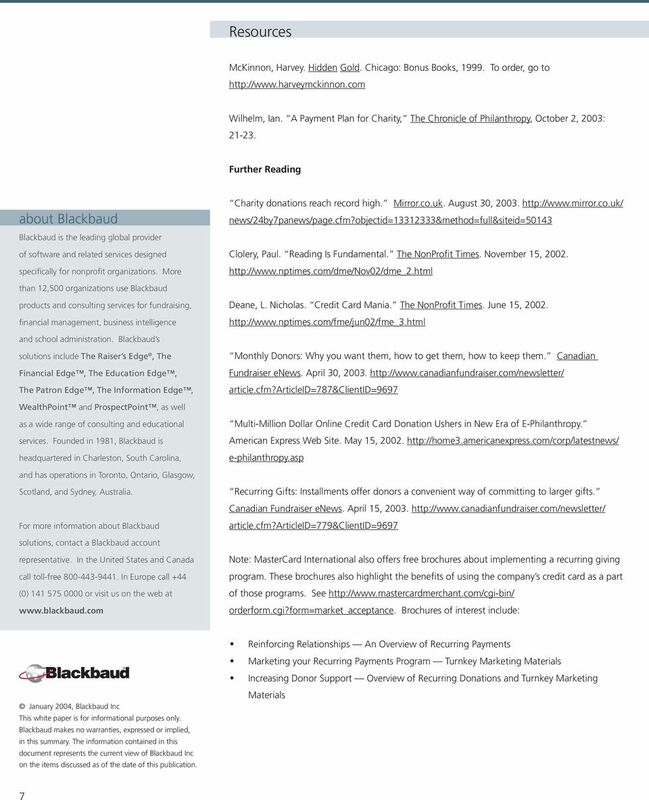 Some organizations continue to send routine solicitations, while other organizations limit or eliminate them. Plan ahead for how you will encourage regular supporters to increase their monthly donations often called upgrade appeals. Thank donors for their previous commitments and gifts and ask for an increase in the amounts they are making monthly. Typically, organizations do not provide an option in upgrade campaigns to discontinue monthly gifts. Instead, they make it clear that donors who want to increase their gifts should respond. If donors do not respond, the organization will continue to collect the original amounts each month. CRM Buyer s Guide Volume I: Volume I: What Is CRM and How Can It Improve My Business? Donor Reten)on: Current Rates Are Plumme)ng. What Fundraisers Can Do to Reverse the Trend! Jay B. Love. Bloomerang.